This isn't an package for an Apple HomePod. It's actually a glitter bomb created by a man upset someone stole his Amazon package. Mark Rober, the video's creator and an engineer who's worked on NASA's Curiosity Rover, tweeted Thursday that he had removed portions of the video after learning they were staged. Rober's viral video has been viewed more than 40 million times. It features a highly engineered fake Amazon box that exploded glitter, emitted a stench and recorded supposed thieves reactions – all at once. Rober said that during the creation of the video, he provided compensation to a "friend of a friend" for placing the bait package on their porch and successfully capturing a thieves reactions. After internet sleuths closely scrutinized the video and alleged inconsistencies, Rober addressed two reactions, totaling about one-and-a-half minutes in the original video: "It appears (and I've since confirmed) in these two cases, the 'thieves' were actually acquaintances of the person helping me." Rober apologized for the error, saying that both the device itself and the reactions it captured after leaving his porch were legitimate: "I know my credibly (sic) is sort of shot but I encourage you to look at the types of videos I've been making for the past 7 years. This is my first ever video with some kind of 'prank' and ... it's pretty removed from my comfort zone. I should have done more. Full stop." The viral video was created after Rober's own experience with package theft. He said that when a woman captured on his home surveillance video stole a box off of his doorstep, he got no help from police. So he decided to take matters into his own hands. 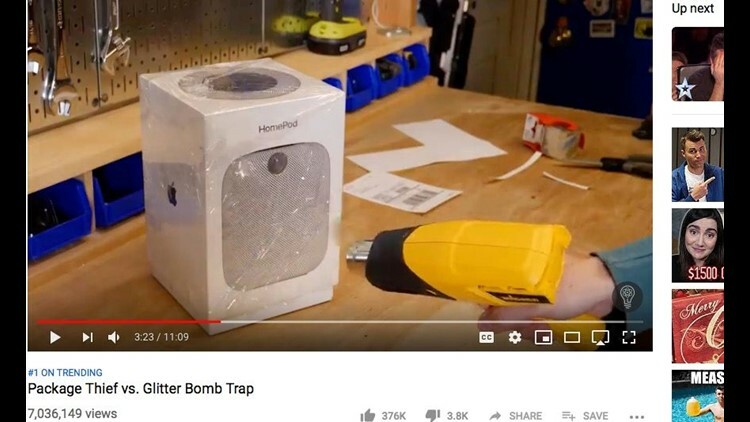 Sponsored by private network service provider company NordVPN, the prank included a fake package engineered with custom circuit boards, an elaborate glitter dispenser, a putrid "fart spray" and panoramic video capture.